I’ve mentioned before how handy it is to have silverbeet growing in the garden. It has such a long season, it’s easy to grow and is so versatile, particularly with a Thermomix to chop it up finely and hide in all manner of dishes. I seem to love it most at those times when I think I have nothing in the fridge for dinner. It certainly saves the day when I can combine it with some fridge fragments and rustle up a meal. Although I usually chop silverbeet up nice and fine to hide it, in this torte, it’s a feature. And, the kids still love it. The recipe is from Stephanie Alexander and she makes it with the children at her Collingwood College kitchen. 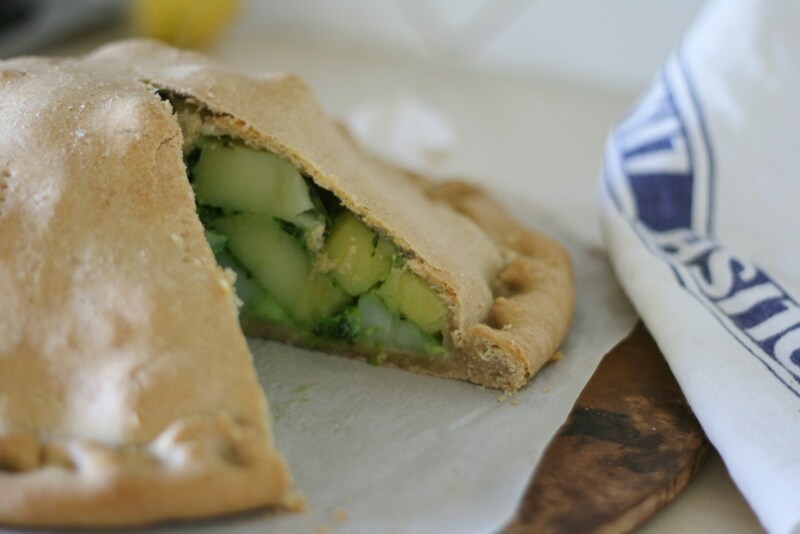 One of my favourite parts about this recipe is the pastry; it’s dairy free and not too rich. 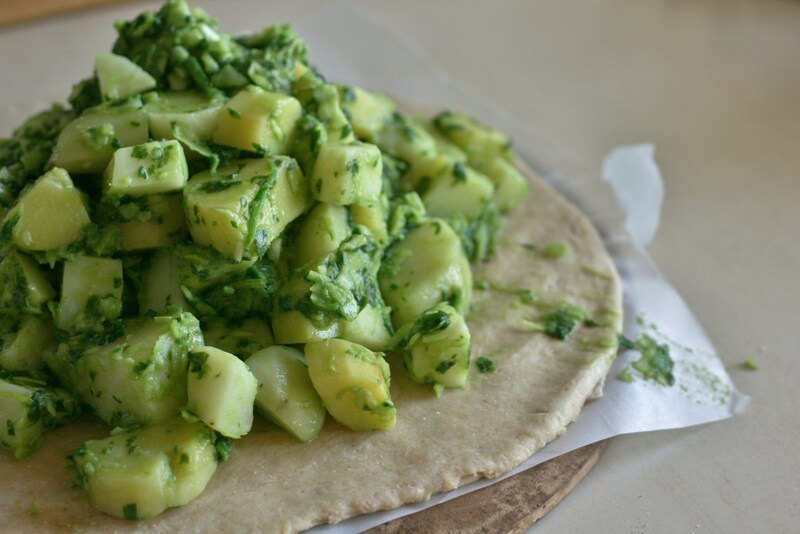 The olive oil makes it so pliable and easy to roll out into a thin base and top. This pastry recipe has become my standard for all, pies and whenever I need a pastry for Edward (my dairy intolerant son). I have adjusted the recipe slightly by adding a little more potato and some feta, it’s perfect with all of that lovely silverbeet. This is a delicious torte for a picnic but I serve it the most with roast chicken and a salad. The onion and silverbeet can be substituted for a couple of leeks and more parsley. For Edward’s dairy free option I make him his own little pie without the cheese. If you wish to eliminate the cheese from the whole pie you can add an extra egg to make it creamier. Oh, and left overs the next day are also delicious! Weigh all of the ingredients into the TM bowl and mix for 5secs/sp6. Set dial to closed lid position and knead 10-20/Interval speed to form dough. Turn mixture onto Thermomat or lightly floured board and knead lightly to bring together. Wrap in plastic and place in fridge..
or until tender. Pull basket out and empty water. Place cheese into TM bowl and grate 5-10secs/Sp8. Set aside. Place onion, stems, parsley into TM bowl and chop Sp5/5secs. Add a splash of oil and saute 2mins/100/Sp 2. Add silverbeet and chop 5secs/sp4 - use the spatula to stir so that all of the silverbeet gets chopped. Add potatoes, crumbled feta, cheese and whisked egg into bowl and stir 5secs/Reverse/Sp2. 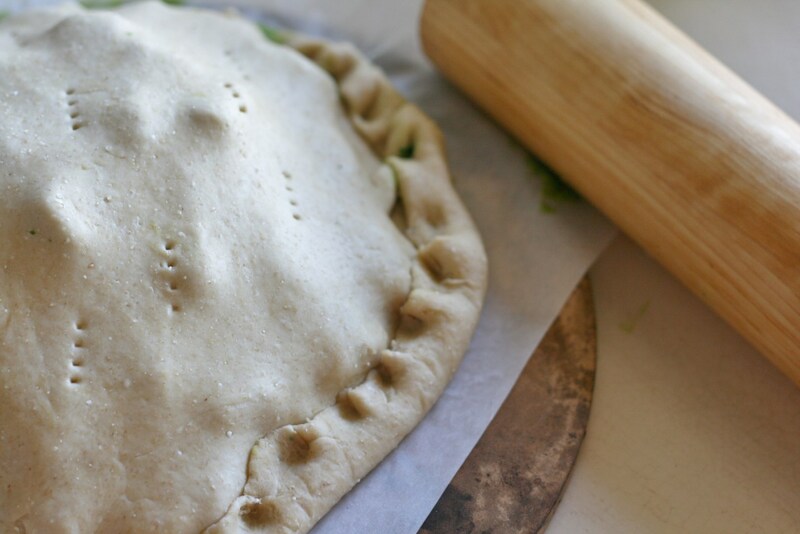 Place the pastry on the pan and pile the potato mixture onto pastry, leaving a border around the pastry. Roll out the remaining pastry in a circle to fit on top. Fold extra pastry from base to seal edges and press together. Pierce top with a fork. Love your pics Tamara and have enjoyed looking through your recipes. Thankyou. !